My family and I thank God for giving us this great opportunity to serve at Immanuel SDA Church family. I am so grateful for God’s leading in my life to be here, at this time. I was born in South Korea. Growing up in Korea as Pastor’s kid, I promised God that I will never ever become a pastor. But somebody did say, ‘Never say never’ and it was very true. My life was turned upside down, inside out. I came to U.S to study at Oklahoma Academy to learn English and find his future. And there I truly experienced God and broke the promise that I made and decided to become a pastor. From there I went on to study at Southern Adventist University in Tennessee where I received a B.A. in Theology. Although in between the study, I had to go back to South Korea to serve in the army for two years, I was determined to finish and become a pastor. My family and I enjoyed our ministry at Toronto Korean Seventh-day Adventist Church where I have served as the assistant pastor in charge of English Ministry since 2011. I was assigned at Immanuel SDA Church as the associate pastor in 2016 and currently serving. 2016 I was ordained by Ontario Conference. I love to work with youth and young adults in every way possible to help them understand the love of God. And with that energy and passion, I go forth with young people in the community to serve the community and help them understand the love of God. I am married to Ahn Na Kim and I am blessed to have her by my side in life and ministry. 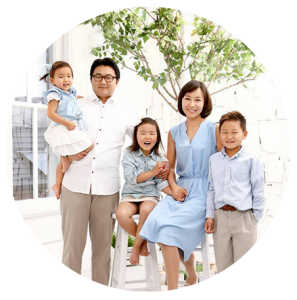 We also have been blessed with three children, Sung Moon (10), Alina (6), and Ashley (4). We are excited to see what God has in store for us in the years to come in our adventure of ministry and living for God.